As we grow as scuba divers, many of us start to specialize in certain types of diving, if not to the specializing point at least a preference. Some people pick up cold water/ice diving and enjoy trips to the Fjords of Norway, the frozen lakes of Switzerland, or a dream trip to the Antarctic. Some just want clear waters, plenty of sunlight, and heavily populated reefs, these divers will head to the Caribbean, Great Barrier Reef or dive sites of the Coral Triangle. Military wrecks bring divers to locations such as Chuuk Lagoon. Those who desire the large pelagic, the apex predators and the challenge of man against nature are a special type of diver. Divers of this type have one mecca, The Galapagos Islands Archipelago. With strong currents, cold waters and deep dives, not everyone is attracted to the islands. Like everything in life, things are not always black and white. While the conditions can be very difficult, the truth of the matter is that most experienced divers will find the Galapagos Islands dive sites within their experience level. An Advance Diver with deep and drift experience who are comfortable in those conditions, will find the dives within their grasp. When we discuss the Galapagos, the conversations often target the epic dives of the very north. These sites are for the experienced diver looking for these once in a lifetime marine encounters, and they get it each dive. We often overlook the central area. It is here, that less experienced divers can experience diving the Galapagos. They will not experience all the large life, but what they do experience is well worth the trip. While many say it is a bucket list item, something to do once in life, those who have tried it often comes back. When is the best time to plan you scuba trip to Galapagos? Diving Galapagos is done year round, but the water temperatures vary depending upon the dive site you choose and the depths you dive to. Surface temperatures range from 18-30 degrees Celsius, or 64-86 degrees Fahrenheit, with September through November being the coldest months and February through April offering the warmest temperatures. When diving here, you can expect medium to strong currents, and this is why only experienced divers, or at the very least, mid-level scuba divers should explore these waters. Unexpected currents do occur, so you need to know how to handle such a situation safely. From July through December, the Humboldt current is experienced from the southeast, and from January through June, the Panama current arrives from the northeast, so there is always some current to be anticipated throughout the year. Darwin Island – This spectacular dive site puts you up-close with whale sharks, hammerheads, and Galapagos sharks, so be sure you are prepared to be surrounded by these intimidating creatures. Gordon Rocks – There are a few dive sites in this area, some better for beginners than others, where you can experience walls with a deep bottom, large schools of hammerhead sharks, sea lions, a variety of fish species, and white-tipped and Galapagos sharks as well. Santa Fe Island – This dive site is one that is appropriate for beginners, thanks to its calm, clear waters, where you can see a variety of tropical fish, sea lions, turtles, eels, and even some shark species. 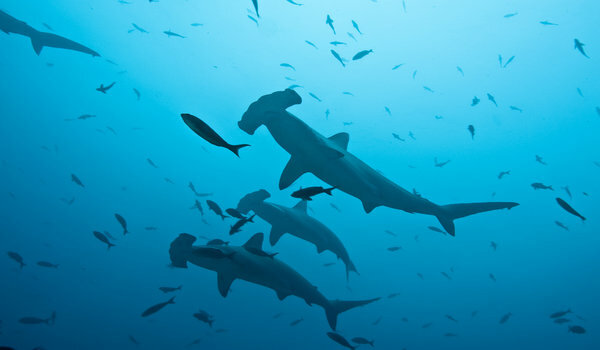 Read more about: The best scuba dive sites found in the Galapagos Islands. Because the Galapagos Islands are part of a marine preserve, you are guaranteed to see an abundance of marine life. Scuba divers visit these islands throughout the year to experience the wildlife both on land and in the sea. Did you know you can also find penguins in Galapagos? Underwater, you can expect to encounter many unique marine animals, including Whale sharks, white tip reef sharks, Hammerhead sharks and the famous Galapagos marine iguanas that swim underwater. 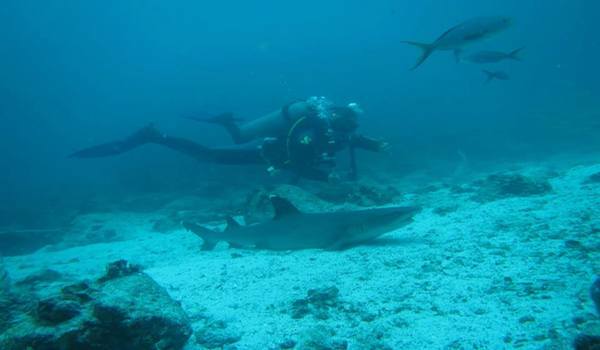 When diving Galapagos also expect to swim with playful sea lions, sea turtles, and several different species of rays. These islands are one of the few in the world that are still largely not impacted by humans, and therefore, the waters are how Mother Nature intended. Any nature lover or scuba diver will adore these islands and will probably never wants to leave them. The Galapagos Islands and the surrounding waters, are part of a marine reserve and national park, many divers and scientists scuba diving here have had an epiphany of nature while exploring this magical place. It is a place that is the home of species that are not normally found together, some from tropical waters and others from temperate. Consequently, it is no surprise that every year divers flock to these islands to explore the pristine natural underwater world that they have to offer. To get to the Galapagos Islands, you first need to travel to mainland Ecuador. Once you are in Ecuador, you can fly from either Quito or Guayaquil to Baltra Island or San Cristobal on Galapagos. There are three daily flights per day from Guayaquil and Quito to Baltra and San Cristobal. These flights take approximately 3 hours. Expect to pay $300 to $500 USD per person for a round-way ticket depending on the time of year you fly. While planning your visit and your flights, remember the 24 hour fly rule after diving.